Artificial intelligence (AI) is not only the next big wave in computing – it’s the next major turning point in human history. Similar to how machine tools, factory systems and steam power ushered in the Industrial Revolution, changing every aspect of daily life in some way, the Intelligence Revolution will be driven by data, neural networks and computing power. AI will extend our human senses and capabilities to teach us new things, enrich how we interact with the world around us, and improve our decision-making. AI is changing our world for the better, and Intel is uniquely capable of enabling and accelerating AI technology. We’ll experience a safer and more productive world by relieving us of a wide range of tasks, such as driving, firefighting and mining, and many more. We will see unprecedented developments in medicine, scientific discovery, education and how work gets done. As the world becomes smart and connected, the premise for AI strengthens. AI is based on the ability of machines to sense, reason, act and adapt based on learned experience. 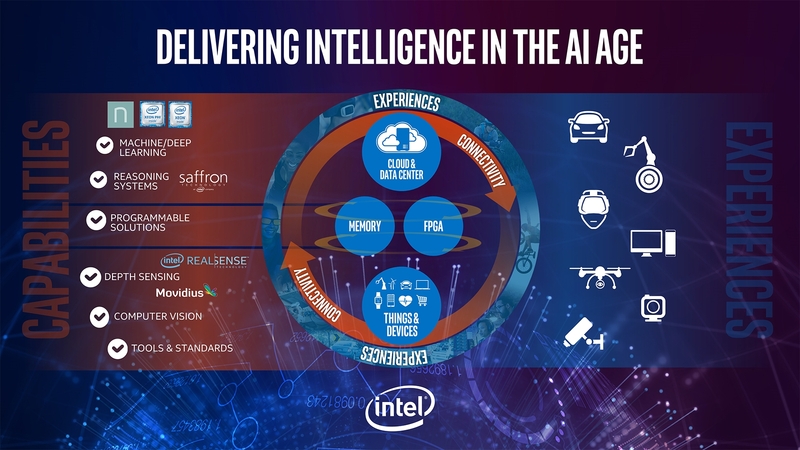 Across this AI spectrum, Intel is using data analytics, machine learning and deep learning to enable holistic machine intelligence. Intel is uniquely capable of enabling and accelerating the promise of AI. Intel is committed to AI and is making major investments across technology, training, resources and R&D to advance AI for business and society. We have a commitment to our partners, the industry as a whole and our global society to accelerate AI development, deliver end-to-end solutions, and lead the next generation of computing transformations. Within our industry, only Intel can make and deliver upon this commitment because of our comprehensive technology portfolio – an unparalleled portfolio developed through acquisition and innovation. Intel uniquely offers a range of computer solutions in the data center from general purpose to targeted silicon, computer vision capabilities, memory and storage, extensible programmable assets, and communication technologies. Building upon these assets, we’ve added Saffron, Movidius and Nervana – a set of leading-edge accelerants required for the growth and wide-spread adoption of AI. The Saffron cognitive platform leverages associative and machine learning techniques for memory-based reasoning and transparent analysis of multi-sourced, sparse, dynamic data. This technology is also particularly well-suited to small devices, making intelligent local analytics possible across IoT and helping advance state-of the-art collaborative AI. Our pending acquisition of this leading-edge computer vision powerhouse, Movidius, will give us a well-rounded presence for technologies at the edge. Embedded computer vision is increasingly important and Intel has a complete solution, with Intel® RealSense™ cameras seeing in 3D as the “eyes” of a device, Intel CPUs as the “brain,” and Movidius Myriad 2 vision processors as the “visual cortex.” These vision processing units (VPUs) deliver performance with an equally important low power and thermal footprint. We also acquired recognized AI leader, Nervana Systems, to accelerate training time, which is a critical phase of the AI development cycle – initially from days to hours and on the path from hours to minutes. The technology innovations from Nervana will be optimized specifically for neural networks to deliver the highest performance for deep learning, as well as unprecedented compute density with high-bandwidth interconnect for seamless model parallelism. We expect Nervana’s technologies to produce a breakthrough 100-fold increase in performance in the next three years to train complex neural networks, enabling data scientists to solve their biggest AI challenges faster. The goal of these acquisitions and investments is to make AI pervasive and accessible. Our goal is to compress the innovation cycle from conception to the deployment of increasingly intelligent, robust and collaborative machines. Intel offers crucial technologies to drive the AI revolution, but we must work together as an industry – and as a society – to achieve the ultimate potential of AI. To that end, we’re leading the charge for open data exchanges and initiatives, easy-to-use tools, training to broaden the talent pool, and expanded access to intelligent technology. The age of AI is in its early days and much innovation is yet to come. Intel® Xeon® processors with GPUs are being used for deep learning, which is a small, but rapidly growing, subset of machine learning. Some scientists have used GPGPUs because they happen to have parallel processing units for graphics, which are opportunistically applied to deep learning. However, GPGPU architecture is not uniquely advantageous for AI, and as AI continues to evolve, both deep learning and machine learning will need highly scalable architectures. Intel architecture can support larger models and offer a consistent architecture from edge to the data center. This is where a broad product portfolio with a holistic ecosystem is a strategic advantage. What a lot of people have realized is that Intel co-processors, like Intel® Xeon Phi™, are world-class. In fact, in the recently released Top 500 Supercomputer list, Intel Xeon Phi represents 80 percent of new system accelerator flops on the list. Accelerators include Intel Xeon Phi and GPUs. 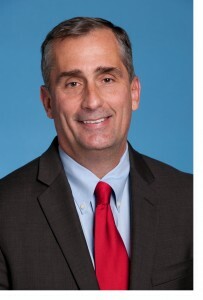 To maximize the net positive impact of AI on our world, Intel is building on our long history as a leader in corporate social responsibility and employee volunteerism, by fostering beneficial uses of AI technology and partnering with government, business and society’s thought leaders to plan for the coming Intelligence Revolution. It’s clear. Intel has the vision, the technologies and the commitment to harness the power of AI to deliver a better world. Now is the time to inspire and innovate for the future.